It took a few more attempts than last year but we finally managed to turn the Vagabond 23 in the hayloft back to upright. After building a sturdy â€œflipping frameâ€ around the hull it was time to roll her over. Originally I thought we’d just refine the rope-through-a-window-tied-to-the-tractor technique which was so successful when we inverted the hull last summer. What I hadnâ€™t taken into account however was that this time around the hull and frame were a fair bit larger and heavier. It quickly became apparent that the rope wasnâ€™t going to safely hold all that weight and a plan B was needed. I then made a trip into the local construction equipment rental outfit looking for suitable tools to do the job and ended up renting four chain blocks. The great thing about building in the hayloft is that there are plenty of sturdy beams to anchor things to. The new plan was to use two of the chain blocks attached to corners of the frame to roll the frame (and hull) up and then the other two would be used to let it down onto its side. After setting everything up and hoisting one side of the frame about 5 feet in the air it became obvious that I wasnâ€™t going to have enough length in the chain blocks to get it all the way over. So the hull went back down, the chain blocks were returned and a beer or two were consumed. A couple of days later I was back at it. This time I figured Iâ€™d attach a second set of chain blocks higher up than the first pair, hoist things to the 5 foot maximum as before and then hook onto the higher set to complete the roll. I knew what I was doing, had a good plan and was eager to get the job done. Maybe I was a little too eager. Because I was using two blocks to hoist the frame I would lift one corner a little bit, then move to the other corner and pull it up by the same amount. 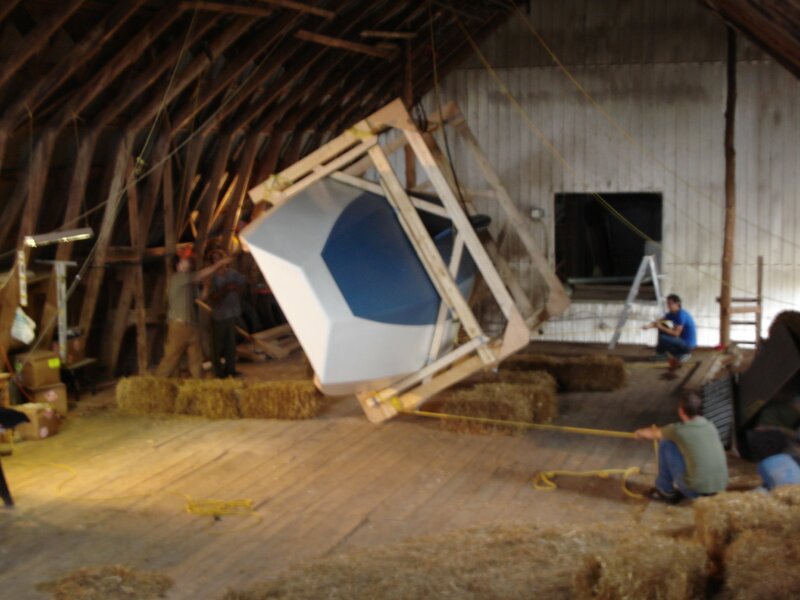 Unfortunately when things were only a couple of feet off the ground I hoisted one corner too far causing the hull and frame to spin so that the bow of the boat was about 5 feet closer to the center of the hayloft. After manhandling it back into place I realized I was going to need some help with this. Using free beer as bait I managed to lure a small crew into the hayloft one evening last week. We setup the chain blocks and this time held the frame in place with lengths of rope. 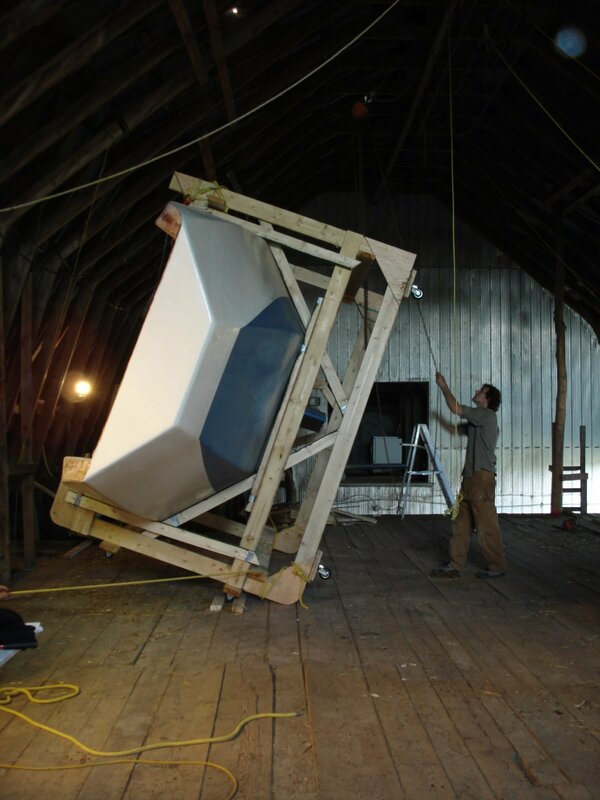 Slowly we turned the frame onto its side, setting it down on a set of casters. Things went so smoothly I was left wondering why I had so much trouble doing it on my own. As a bonus, my brotherâ€™s girlfriend was on hand to take a bunch of great photos. Iâ€™ll put up a gallery when I get a chance.